One of America’s most respected loudspeaker brands is launching in the UK and Europe. Definitive Technology, part of the Sound United group, along with Denon and Marantz, is launching with five speaker ranges, suitable for music, movies, as well and custom installation. 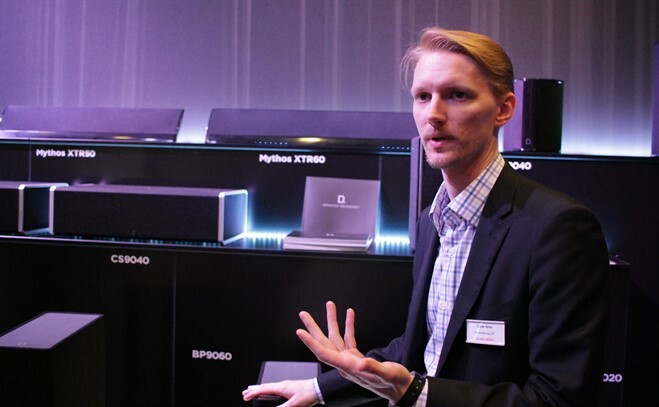 Topping the line-up is the BP9000, a flagship home theatre system with bipolar speaker technology. The BP9000 Series consists of four floorstanding tower speakers, each with built-in active subwoofers. The range-topping BP9080X also has a top-mounted Atmos module, using upward-firing drive units to deliver the height channels required for immersive sound. The other three towers can be used with optional A90 Atmos modules. Their room-filling bipolar sound can be adjusted for a diffuse sound or precise focus, by altering the balance between the front-firing and rear drivers. There’s also a choice of three centre speakers, two of which have active subwoofers built-in, and two bipolar surround speakers, which combine with the floorstanders to a full surround system. For those looking for a smaller form factor, it will also debut its Demand series of bookshelf speakers, honed by an acoustic specialist team located in Europe. A three-strong range of bookshelf speakers, Demand sport a unique choice of drive units: the treble driver is offset by 5 degrees to eliminate symmetrical diffusion from the corners of the baffle, while a new 20/20 Wave Alignment Lens smoothes the off-axis response of the tweeter. A passive bass radiator is used to tune the low frequencies in the larger D9 and D11 models, while the smallest Demand Series speaker, the D7 users a reflex port. The Demand Series features both wall-mounts and a locking system to fix the speakers to optional ST1 stands. Custom installers will also be interested in the brand’s Mythos line of ultra-slim on-wall models, and its, Di and Ultimate In-Wall (UIW) series. The company also offers a range of All Weather Outdoor speakers.